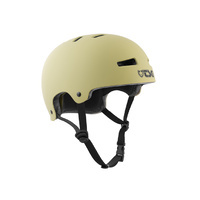 The revolutionary TSG Dawn Flex helmet finally brings true soft fit comfort combined with a CE certified construction. This is what soft shell users have been waiting for: the perfect compromise between comfort and safety. We have added our FlexTech innovation to this classic full cut design with ear protection. The Dawn Flex utilises a series of interior EPS foam segments connected by a reinforced skeleton, allowing the helmet to flex and mould to your head while still exceeding safety standards. The result is a lid that fits snugly without cramping and will exceed all your expectations.